Frostie Old Fashion Root Beer was introduced in Catonsville, Maryland in 1939. The president of The Frostie Company was George Rackensperger, who rented an abandoned jailhouse outside Baltimore in which to start his soft drink bottling operation. According to the story, the bottling equipment was placed in the garage that had housed the police wagon and the storeroom for sugar and bottle crowns was made from the former cells. Originally, Rackensperger made several flavors of soft drinks, but this had to be whittled to one – Root Beer – in order for him to meet the customer demand. In addition, the plant had to be moved to a newly constructed, larger and more modern building to accommodate the booming business. 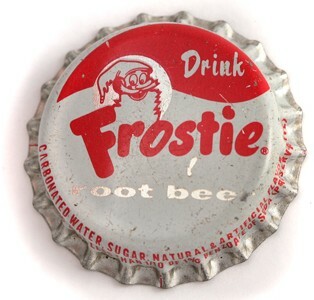 Before 1947 Frostie became franchised and was available across the entire country by the 1950s. At its height, this brand was being bottled at 300 licensed plants in the US. Frostie sodas originally were sweetened with cane sugar, but today they use high fructose corn syrup, giving it a slightly different taste. Flavors that Frostie is available in today are Root Beer, Diet Root Beer, Cherry Limeade, Vanilla Root Beer, Blue Cream, Orange and Concords Grape.